Hi friends, I hope you're all staying warm this week! 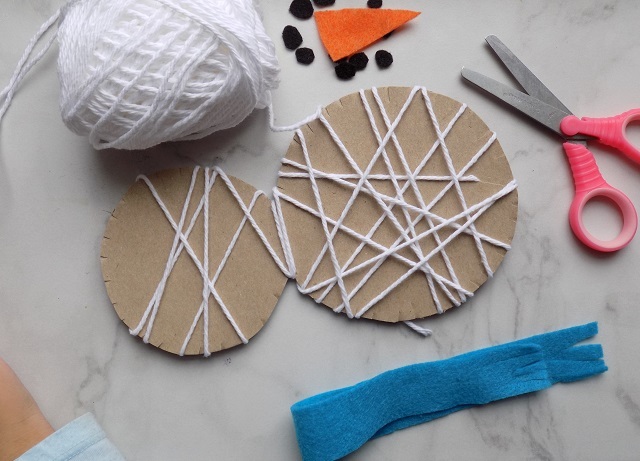 This snowman yarn wrapping craft was the perfect [ super simple! ] way to entertain my toddlers indoors for a bit yesterday. With the cold snap that we've been having here these past few days [and a big snow storm in the forecast for this weekend!] I've been raiding my craft supply bins daily, to keep my younger two children entertained. 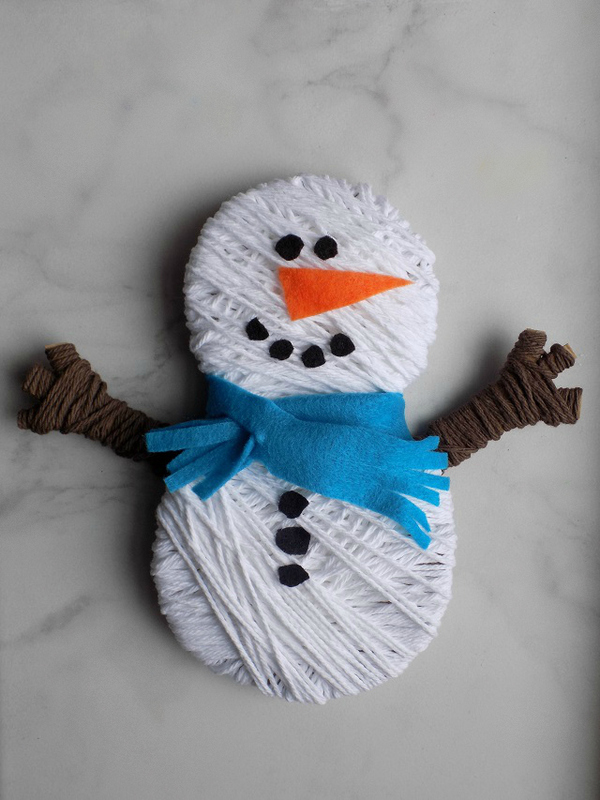 Read on for the full supply list and easy tutorial, to make this snowman yarn wrapping craft with your little one! Cut a snowman shape using safety scissors and upcycled cardboard. Create small 1/4" slits around the perimeter edges of the cardboard form . Cut two "twig" shaped arm pieces using safety scissors and upcycled cardboard. Create (1) 1/4" slit in the bottom of each "twig" shaped arm piece. 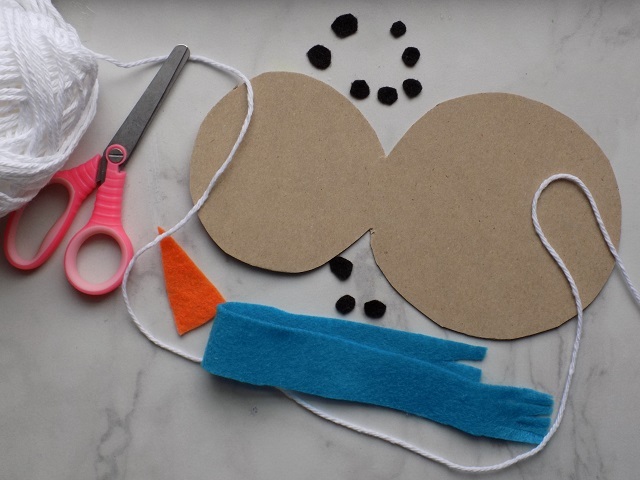 Cut the felt pieces for your snowman. Black felt; eyes, mouth, "buttons." Orange felt; triangle nose. Contrasting color felt (we used blue;) scarf (fringe ends and create a 1" slit in the scarf piece about 2" from one of the ends.) Set felt pieces to the side. Slide the end of the white yarn into one of the slits in the cardboard form. 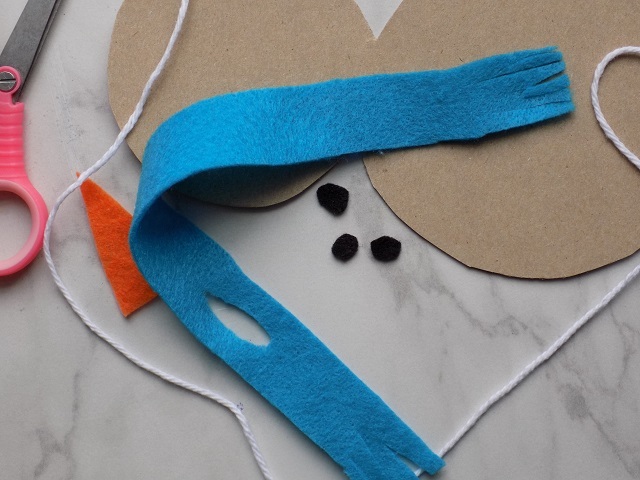 Using craft glue, glue down all of the felt components to your snowman. 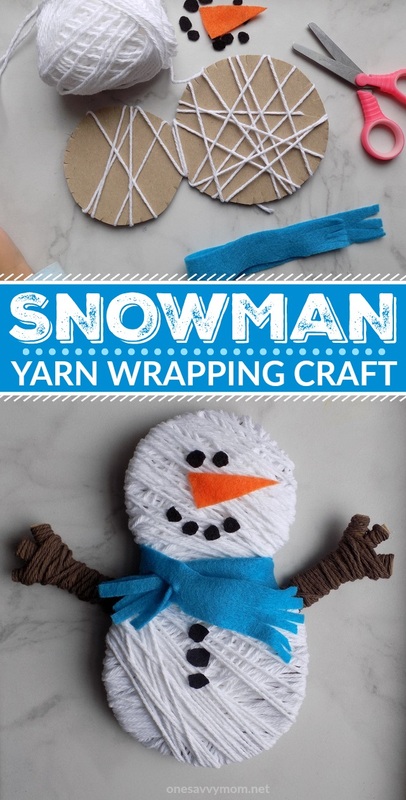 Display your completed snowman yarn wrapping craft, and enjoy! Happy crafting! Stay warm, friends! When I was a kid we always used to do projects like this. For some reason, we don't really do them with our kids. We have game nights, but I think craft nights would be more interactive. This is super cute! If you wanted to make this a little smaller, it would make a cute Christmas ornament too!